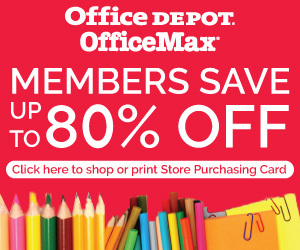 Did you know that I Fly America members have exclusive access to significant savings at Office Depot and Office Max? You can save up to 80 percent off on preferred products, receive free next-day delivery on online orders over $50, and if you spend over $75 on your first online order, you'll get $15 off (offer good until 3/26/16)! Visit www.officediscounts.org/ifly to shop online or print your free Store Purchasing Card to take advantage of these great savings today!